Hollywood Sound Systems is pleased to present the latest from the Bose Professional line of products — the Bose ShowMatch™ System — a cutting-edge, turn-key solution to sound design — from small clubs, theaters, houses of worship, auditoriums, arenas, or performing arts centers — it is completely scalable to any (indoor or outdoor) environment. The System combines the technology of the Bose ShowMatch™ DeltaQ™ Array Loudspeakers with Powersoft® X4 Power Amplifiers, Powersoft Armonia Pro Audio Suite™ Software, and the AFMG® EASE® Focus Acoustic Simulation Software (which allows 3D modeling of audience areas, etc). There is no question you will be amazed by the versatility and flexibility of this system, and the possibilities it offers. Contact us for more information — we'll help design the perfect sound system solution for your organization, company, or upcoming event. WHAT IS INCLUDED IN THE SYSTEM? The ShowMatch™ DeltaQ™ Array Technology improves sound quality and vocal clarity by allowing directivity, or “Q”, to vary with each array module — that means more sound to the audience, less to walls and floors. Available with 5°, 10°, or 20° vertical coverage, array modules provide cutting-edge versatility, improve sight lines, reduce rigging weight, and lower system costs — get the array coverage you need with fewer boxes. Replaceable waveguides allow changing horizontal coverage to best match audience coverage needs and can form asymmetrical patterns for improved acoustic performance in left/right arrays. 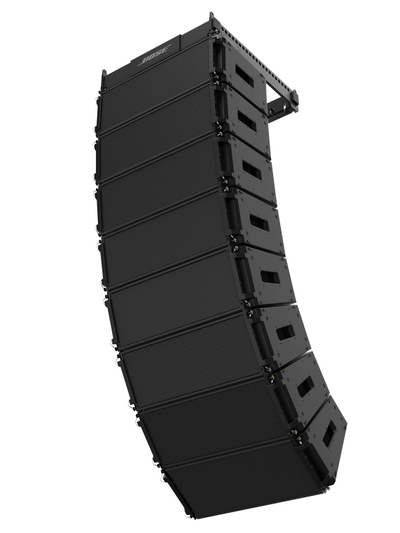 The DeltaQ™ Array Loudspeakers provide the highest full-range output in size class — with 145 dB peak array output levels generated from proprietary 2x8” neodymium woofers and 4x EMB2S neodymium compression drivers, with more usable low-frequency output in smaller arrays. Compact, portable enclosures with removable “side guards” optimize design for both installation and portable applications — from small clubs and houses of worship, to the largest performing arts centers and concert-sound amphitheaters. Matching-width 1x18” subwoofer and complete rigging accessories are also available. The Bose Professional ShowMatch™ DeltaQ™ SM5 full-range array modules provide 5° nominal vertical coverage with included field-changeable waveguides offering the choice of 70° or 100° horizontal coverage with optional accessory 55° waveguides. Replace single waveguide panel to form horizontal asymmetrical patterns. The 2-way module requires external power amplifiers (2-channels) and DSP to provide full-range response from 59 – 18,000 Hz with peak array output of up to 145 dB. The ShowMatch™ DeltaQ™ SM10 full-range array modules provide 10° nominal vertical coverage with included field-changeable waveguides offering choice of 70° or 100° horizontal coverage. Replace single waveguide panel to form horizontal asymmetrical patterns. The 2-way module requires external power amplifiers (2-channels) and DSP to provide full-range response from 59 – 18,000 Hz with peak array output of up to 145 dB. The ShowMatch™ DeltaQ™ SM20 full-range array modules provide 20° nominal vertical coverage with included field-changeable waveguides offering choice of 70° or 100° horizontal coverage and optional accessory 120° waveguides. Replace single waveguide panel to form horizontal asymmetrical patterns. The 2-way module requires external power amplifiers (2-channels) and DSP to provide full-range response from 59 – 18,000 Hz with peak array output of up to 145 dB. 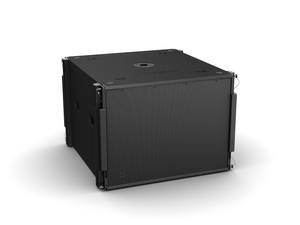 The ShowMatch™ SMS118 Subwoofers are designed primarily to integrate with DeltaQ™ array loudspeakers and extend low-frequency response down to 29 Hz. The SMS118 enclosure width and integrated rigging allows fast integration in arrays with ShowMatch™ full-range modules using optional array frames and accessories. The portable-rated Baltic birch enclosure may also be used for ground-stack applications and includes an integrated mounting-pole adapter for use with other mid/high loudspeakers. The Powersoft® X Series redefines the concept of amplifier platform with its ability to implement a new system of channel routing, new worldwide compatible three-phase power supply, and a revolutionary full-featured DSP. It natively supports AES3, two redundant Dante™ by Audinate® digital streams and analog inputs, providing up to 4 different selectable input sources per channel. The Powersoft® X4 Power Amplifier features 4 output channels, each rated for up to 5200 watts, with a global power supply that accepts 85 – 440V, including 3‑phase. 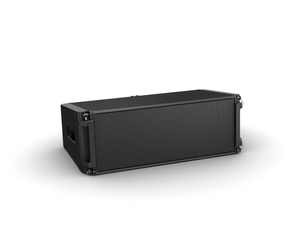 The X4 includes integrated loudspeaker DSP with analog, AES3 and Dante™ digital audio networking. 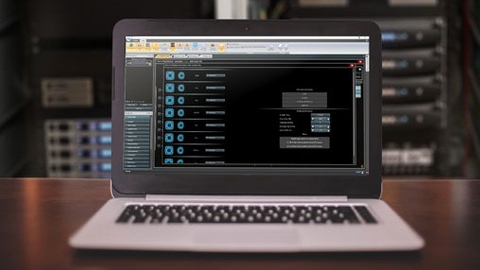 The Powersoft Armonia Pro Audio Suite™ provides remote control set-up and monitoring of the Powersoft amplifiers; set-up and manage complex sound systems easily through a highly intuitive user interface, with unique tools to significantly improve sonic performance and system reliability. 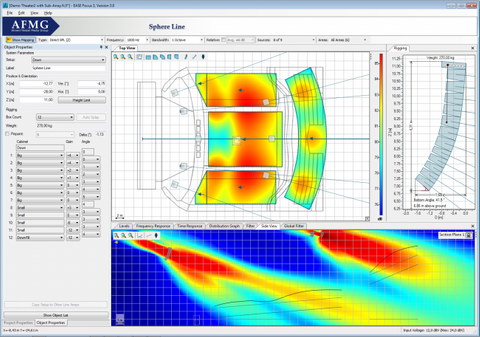 AFMG® EASE® Focus Acoustic Simulation Software allows 3D modeling of audience areas with prediction of acoustic direct‑field coverage, sound levels, and frequency response, plus rigging pitch angles with auto‑splay calculation. The Bose ShowMatch™ GLL files are licensed to allow use in both Focus and “full” EASE software.